Wargaming Tasks – 2019 – another indulgence I am sure! Back in 2017 I wrote a post, a Self Indulgence – the Wargaming Tasks for 2017 which was, really, a self indulgence. Doubly so as I achieved the following in the two years since then … painted 24 tanks for the Cold War Poles, 12 for the Cold War Danes and prepped the rest of the Poles. So, the painting queue then is still there in the painting queue now. 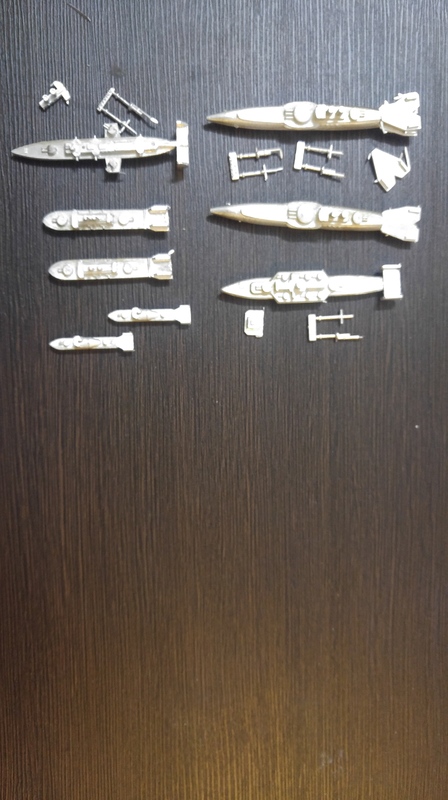 I am pleased to report that over the past two years, while doing some work on Anthony’s 20mm World War II British, they are not yet finished (although I am planning on correcting that error tonight as I reckon they are my painting block). 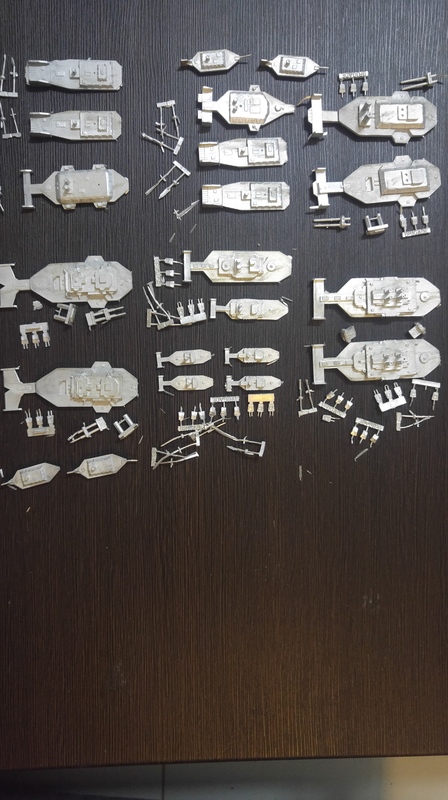 I did complete the 1/300 scale Cold War Commander Danes … mostly. 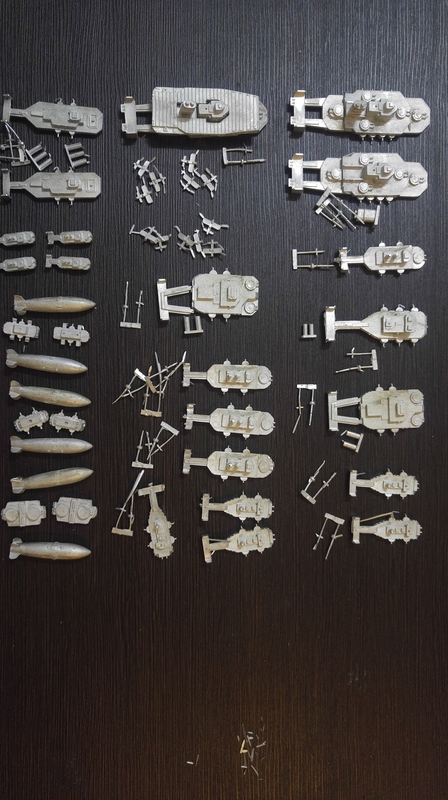 There is a useable army there with reinforcements in the form of some Leopard tanks but there are still about 12 bases of Infantry that can be painted and added to that army to finalize it. 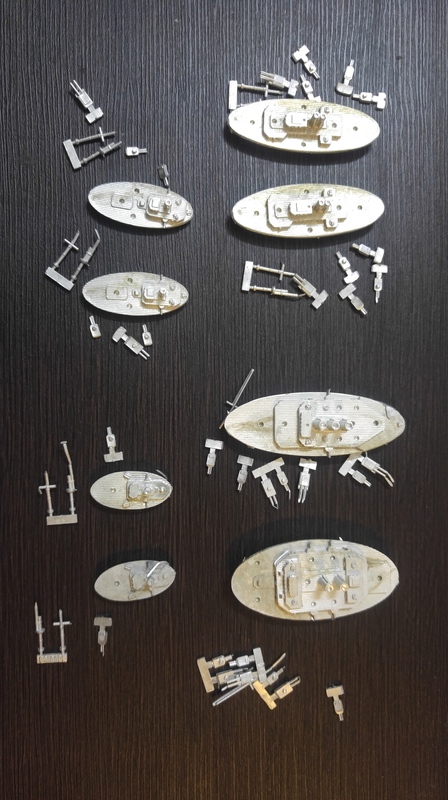 The 1/1200 Coastal Warfare boats and ships have been based and undercoated and I have also added Italian MAS boats to the collection. 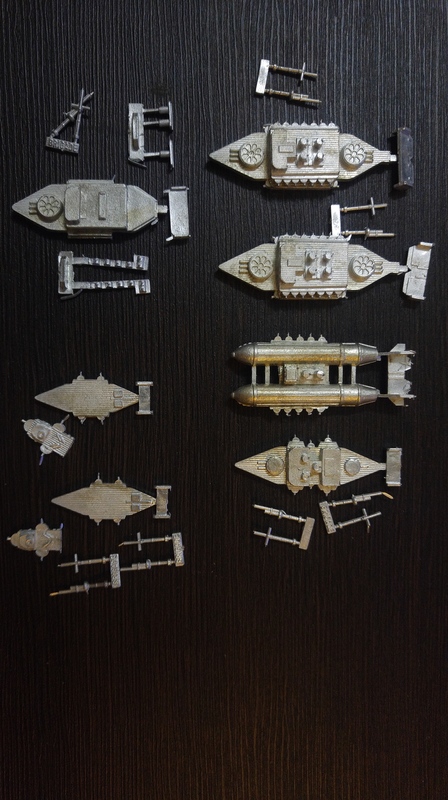 So, add to that the other stock items here such as the fleets from the Battle of Matapan, Philippine Sea and Jutland and you can see that if a wargamer never dies while ever he has items to paint, I should live tp about 150. Oh, and to add to all that, I brought a couple of boardgames back that I really want to get some game time on! My painting queue, an indulgence indeed! One of my favourite YouTube channels is the Little Wars TV channel. I come home from work, late at night, set the TV to YouTube and tune in to see what is up with the guys this week. The guys re-fight battles, review rules and generally behave and talk like wargamers behave and talk. This week I enjoyed the refight of that well-known battle of Hannibal’s – Trebbia. The Romans were defeated historically in this, Hannibal’s first battle on Italian soil and most ancient wargamers know the Battle of Trebbia so it is hard to get the Romans to walk into the trap that is set there. The Little Wars guys do it well. It is also great looking at the way they have based and used 6mm figures for the game – with all figures based in 40mm square bases. They do give the impression of two armies facing off against each other. Last weekend I had the time to indulge myself in my fantasy – the painting queue for 2017. I had originally thought it was not that extensive as I had not purchased all that much in the way of new lead in 2016 and besides, I did not have too much left over for painting from 2014 and 2015. The painting queue follows in not particular order! 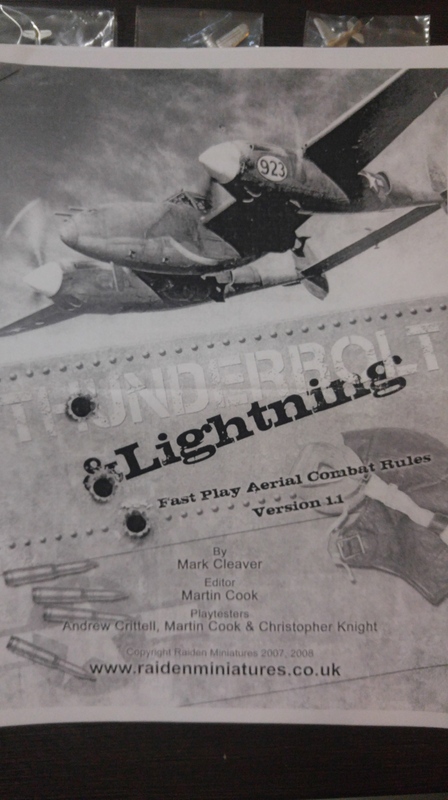 The rules are Raiden Miniatures Fast Play Aerial Combat Rules. I have version 1.1. Any of the World War II aerial combat rules could be used. The beauty with the Winter War is that a mix of aircraft seldom seen on the wargames table is possible with the Finns using equipment from Italy, the Netherlands and the USA, among others. Raiden also make a US WW2 aircraft carrier flight deck, the USS Enterprise, for flight and combat operations. 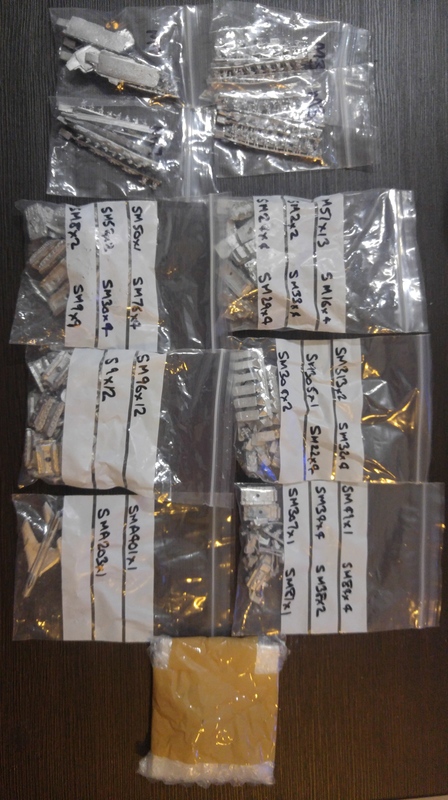 It is a kit in 51 parts and I am not sure if it is made or not currently. See http://www.raidenminiatures.co.uk/4.html for details. 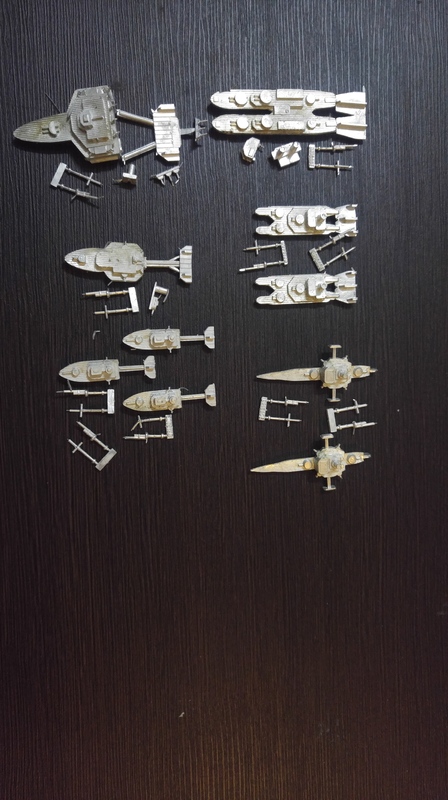 Starmada vessels from Brigade Models. In this case, the PacFed fleet. I have a PacFed Future War Commander Army tucked away up here and this is the off-planet version of those. The PacFed are loosely based around a “Pacific Federation” and contain a lot of vessels with Australian type names. As an opponent to the PacFed I looked to ONESS – loosely based around German forces. Somewhere at mum’s I have the ground fleet to complement this. This also is from Brigade Models. 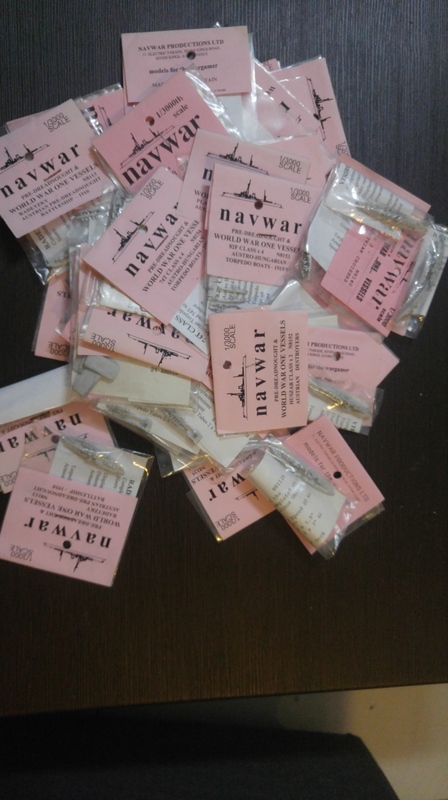 Speaking of Brigade Models, I acquired a US Aeronef fleet. 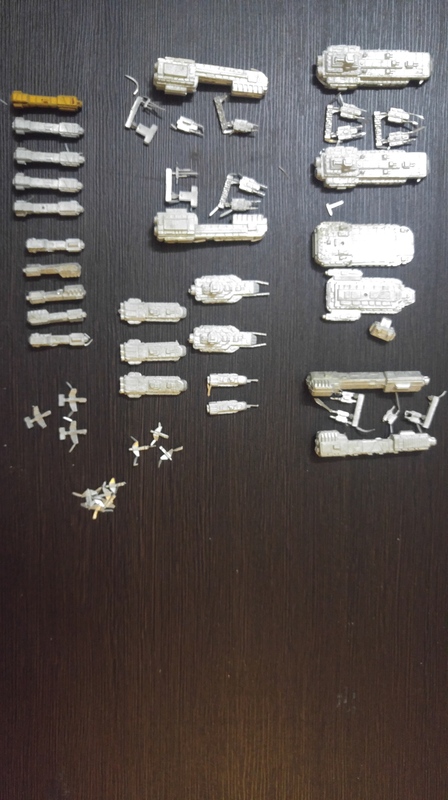 This was for part of the Peshawar project but with the purchase of Imperial Skies, the project has expanded somewhat (see below for how much). Of course what is illustrated and discussed here does not mention the British, French and Prussian Aeronefs that are already in the collection. These then are the US Aeronef fleet. Quite a tidy force. I have been trying to think of an alternative paint scheme other that the Great White Fleet colours of, well, white! The perfect opponent for the Americans above – the forces of the Rising Sun. 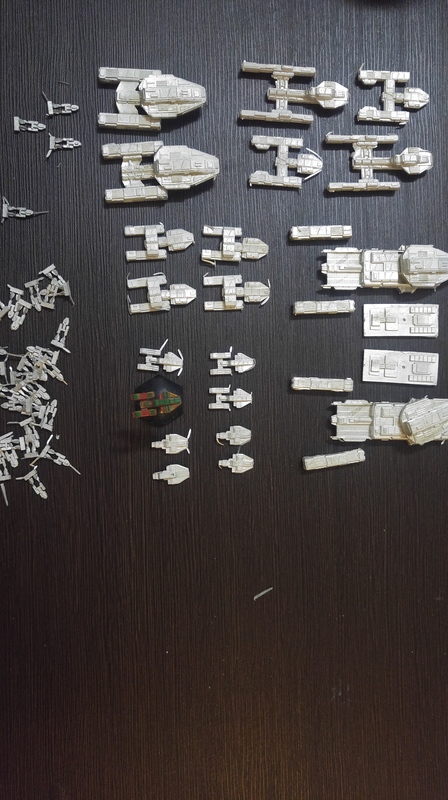 Both Fleets (the US and Japanese) are substantial and would be the two most powerful fleets in the collection. As with the Americans I am trying to think of a colour scheme that is not the Japanese naval vessels at Tsushima! 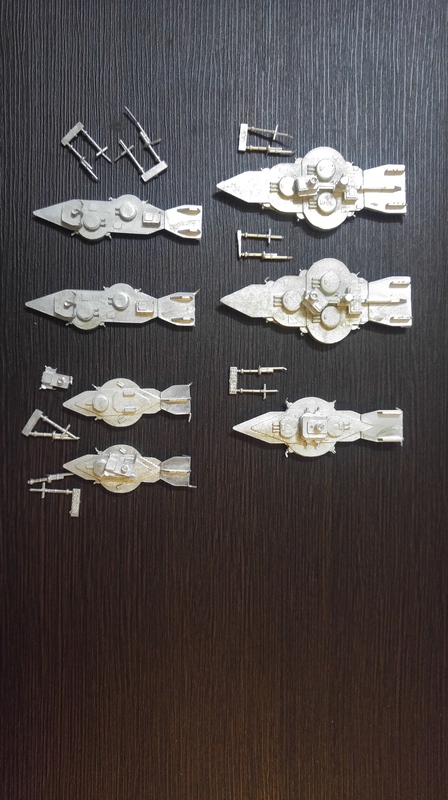 I wanted a bit of fun so I added a Scandinavian Union fleet. Dumpy vessels certainly but they have a certain attraction as well. These are also from Brigade Models and I am pondering colour schemes for them. These were never envisaged for the Peshawar Project however they will make a good opponent for the BENELUX forces described below. For a little South American Aeronef action I picked up some Argentinians. These look sufficiently different to other ‘nefs to keep the interest up. Rather than a standard grey or Victorian Livery for these I have been toying with the idea of basing a paint scheme around light blue and white – same colour as the shirts of the Pumas. Again, Brigade Models. And if the Argentinians are light blue and white then the Brazilians should be both hairless and based around green and gold colours. I have an idea for that with an antique style of gold colouring. An opponent for the Scandinavian Union, and possibly the Italians. The Benelux Aeronef fleet consists of vessels from Belgium, the Netherlands and Luxembourg. The last of the Aeronefs in this years paint queue, the Russians. They are also one of the protagonists in the Peshawar campaign. For colours on these I am thinking, maybe, something like Port Arthur 1905. A couple of years ago I picked up two armies for the Great Pacific War. Here are the Chilean/Peruvian Army and the Bolivian forces. I am planning on using these with the 1859, 1866 or 1870 rules. A project that has been on the back-burner for three years now. 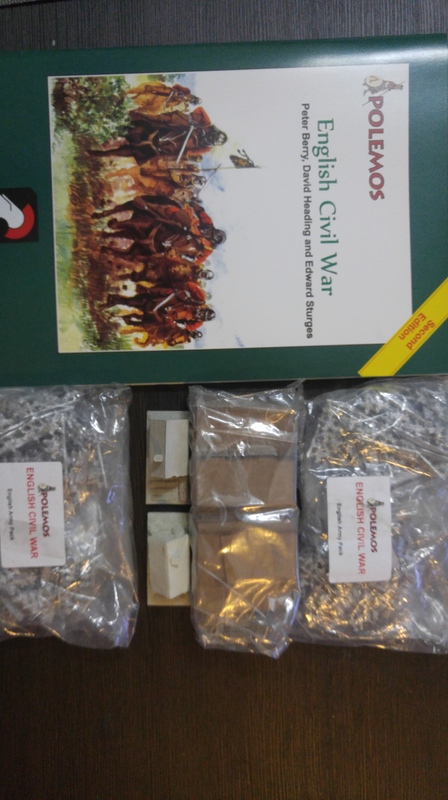 I have had an interest in both the English Civil War and the 30 Years War for many years and picking up Baccus 6mm‘s English Civil War boxed set seemed like a good way of getting into it. The set gives me two armies, a couple of houses, Polemos rules and 60mm bases. I am planning on using these with the Baroque Rules from Dadi and Piombo as well. 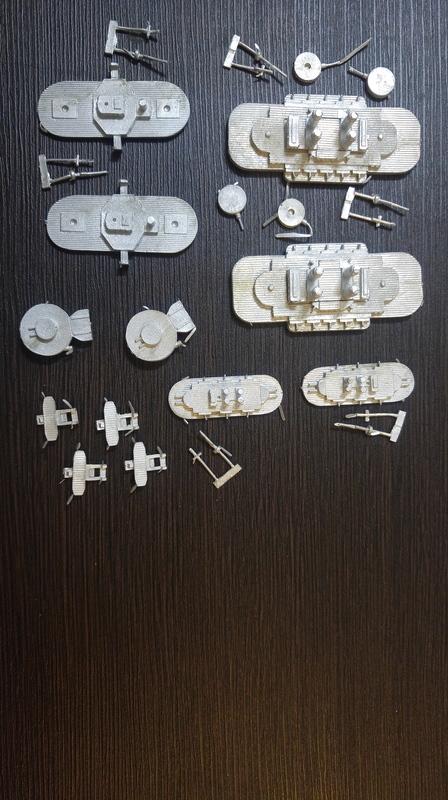 Navwar 1/3000 scale World War I Austrian ships – battleships to destroyers/torpedo boats. I have their main opponent, the Italian fleet, painted and here already. It must be said that during the war, both the Italian Royal Navy and the Austro-Hungarian Navy kept their most modern capital ships inside their bases (Pola and Kotor for the Austrian Fleet, Brindisi and Taranto for the Italian fleet), leaving mostly submarines, destroyers, torpedo boats and scout cruisers to do any fighting. Heroics and Ros figures have been used for my Cold War Poles – an opponent for my Cold War Danes. So – a painting queue that for 2017 should keep me busy well into 2020! 23 April 2017 – Update: Nothing. Nada. Not done a thing! Maybe I need to motivate myself and buy some more figures. So I finally collected everything. 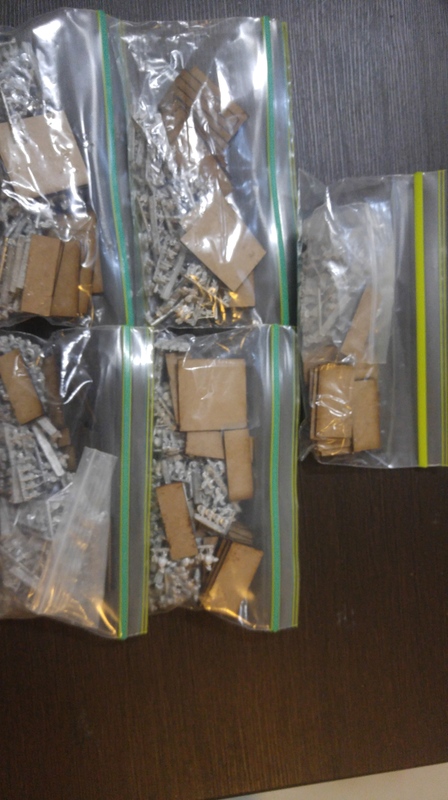 I have the baseboard (thank you Doug for the idea), paint, materials for terrain, figures to make 7 DBA armies from around the time and area of the Punic Wars as well as pre-cut bases to base on it all. A can of Tiger beer and a planning session gave me the plan. The project will follow the following order (well, that is the plan at the moment at least). Paint the base board. The reason for starting with this is that I feel it will be a basically straightforward job, fairly quick and give me something complete to look at to encourage me for the other parts of the project (especially as there is another wargaming project at the back of my brain at the moment as well). 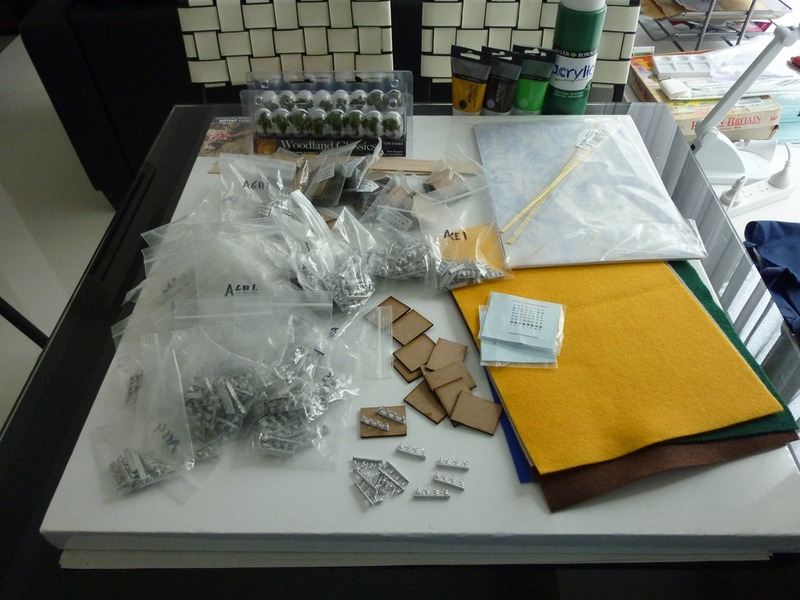 Cut, assemble and make the terrain pieces. again, something reasonably quick and there are a couple of techniques I want to play around with. Paint and base the army with the least number of figures to deal with. This will be the Numidians. Whilst they are not part of the base set, there are some Numidians present in some of the armies anyway so the extra bases will be painted at the same time. They will give me a head start to some of the forces as well as giving me something pretty to look at. Start on the main 6 armies. When it gets closer to this time I will decide on the order to take. OK – ready to start. As I mentioned earlier I’ll be blogging the progress as this will help force me to keep to the plan. To the left is a close up of some of the figures. 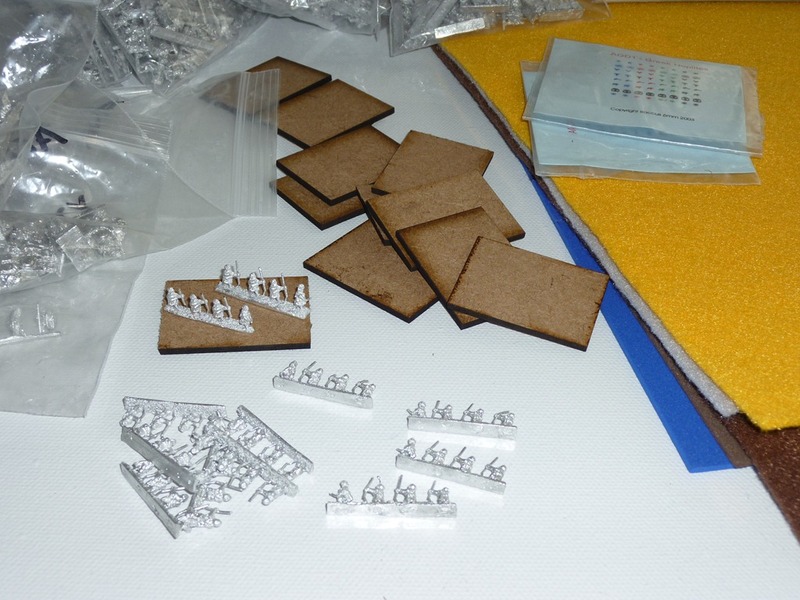 The wooden bases you can see are 40mm x 30mm in size and the figures are just over 6mm small. Right then, to paint! Tally ho the brush! I mentioned that I was going to build this set using 6mm figures from Baccus 6mm. There are seven armies being prepared over time but I thought, as it was payday last week, to buy all the figures at one time. Two orders were therefore sent to the nice Mr Berry of Baccus (his shopping cart got overloaded halfway through the order ) and if previous deliveries are anything to go buy, a nice parcel should arrive at the office next week. This will be enough figures to make the seven armies with leftovers. Later I will break up the armies into their contents. 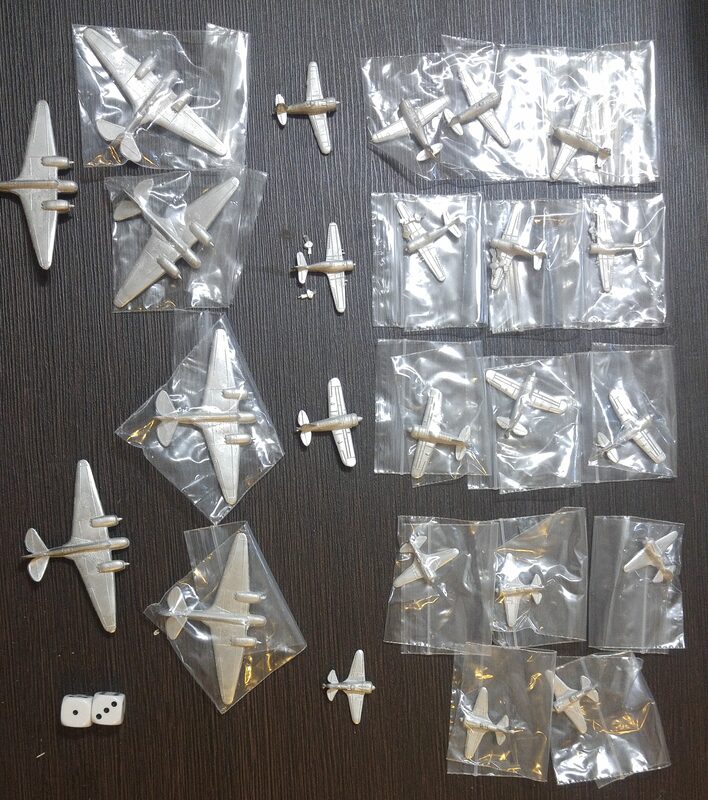 In the meantime, the next step is to an email an order to East Riding Miniatures for bases for the figures. I will be using the standard DBA 40mm wide bases for this. Yesterday I detailed the terrain to be purchased for the project. I mentioned earlier as well that once I started looking at possible armies, one of the campaign sets popped up as an obvious choice. The 2nd Punic War campaign has a good group of armies all of which are fairly competitive and that together will make some interesting combinations for big battle games. Of course, given the usual wargamer’s megalomania, I could not just leave it at that six but decided to add a seventh, just for interest sake. 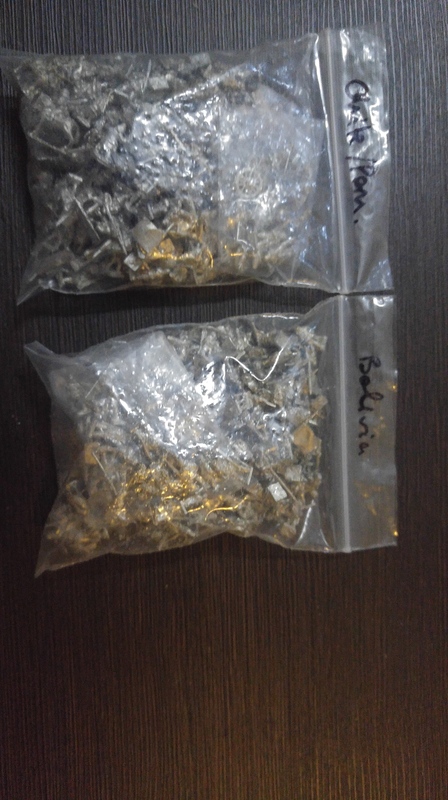 All these armies will be made with Baccus 6mm figures and based on 15mm sized bases. OK, these then are the armies to be purchased and painted. Chariots of Fire was the first game I had purchased recently from GMT Games. The other game I purchased at that time was Carthage. Carthage is one of the games in the Ancient World Series. The first of that series, Rise of the Roman Republic, is out of print. Carthage being the second and most recent still is in print. I’ve always (well, for the last 40 years anyway) had an interest in Carthage, the Phoenician colony on the North African coast. Carthage almost bought Rome to her knees before she was an established power. The struggles between Rome and Carthage produced two of the great captains in history – Hannibal and Scipio Africanus. 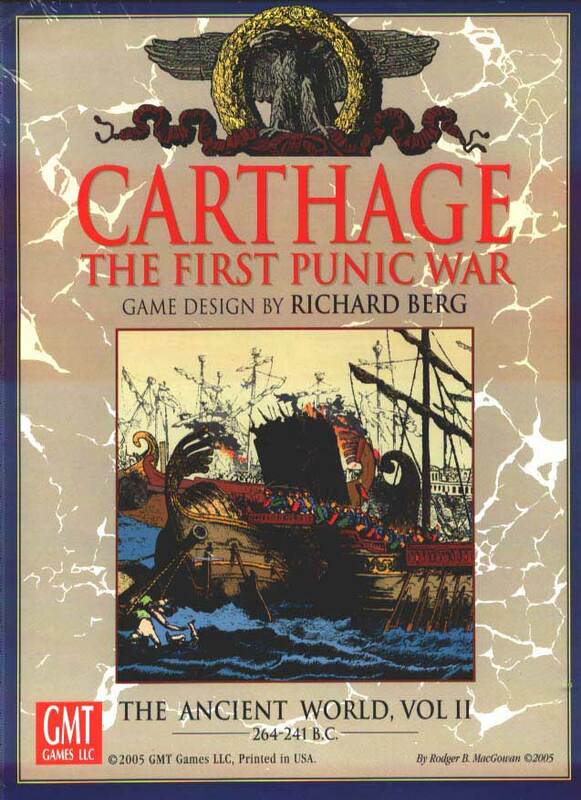 The game Carthage concentrates on the First Punic War. This was the precursor to the one made famous by Hannibal and Scipio. Indeed, it was in the First Punic War that Hannibal’s father fought and were the oath taken by the father on behalf of Hannibal was made, the oath that the Barcas would fight the Romans until they succeeded in destroying them. The game components look good with two maps covering the main areas of conflict (Italy, North Africa and Sicily). There are over 1,000 counters in this game as well. The Mercenary War, 241 B.C. At the completion of the First Punic War over, the Carthaginian mercenaries in Sicily sought payment. They were sent back to Carthage where they were paid a small amount of what was owed to them and then they sere shipped off to Numidia. After a while they revolted and massacred a number of officers then laid waste to Carthage. Some Libyans joined in the revolt. In the end Hanno was compelled to assemble an army of veterans and elephants to combat the mercenaries. Hamilcar Barca (Hannibal’s father) returned to Carthage from overseas as well with a mostly mounted second army and Navaras, a Numidian chieftain joined with Hanno to put down the revolt. Agathocles, 311 B.C. In this scenario the Carthaginians are fighting against Syracuse, led by the ambitious tyrant, Agathocles. This fighting was based around Agrigentum (Acragas). Hiero, Hero or Gyro? 264–263 B.C. This is an introductory scenario, simplified in its approach and what it involves. Very good for learning the game system. The First Punic War, 264 to 241 B.C. This is the full war – with the folks at GMT making the assumption that our game war will end at the same completion date of the First Punic War generally. Board Game Geek has Carthage rated at 7.47/10. As with Chariots of Fire, I am very much looking forward to getting into this game.